I’ve touched on the fact that I’m inordinately fond of dishes and glassware, but I’ve never actually admitted to this addiction on the blog. I love dishes. It’s almost a sickness. My kitchen cupboards are jam packed and the china cabinet doesn’t have room for much else – though I’m holding out for more moriage dragonware plates. Besides dishes, I have a fair amount of tea pots and tea cups – one set a gift from a friend who died a few years back. I have multiple sets of dishes and pretty much use them all as circumstances dictate. A good many of them are cobalt blue and I’m completely in love with my blue and white “everyday” dishes. 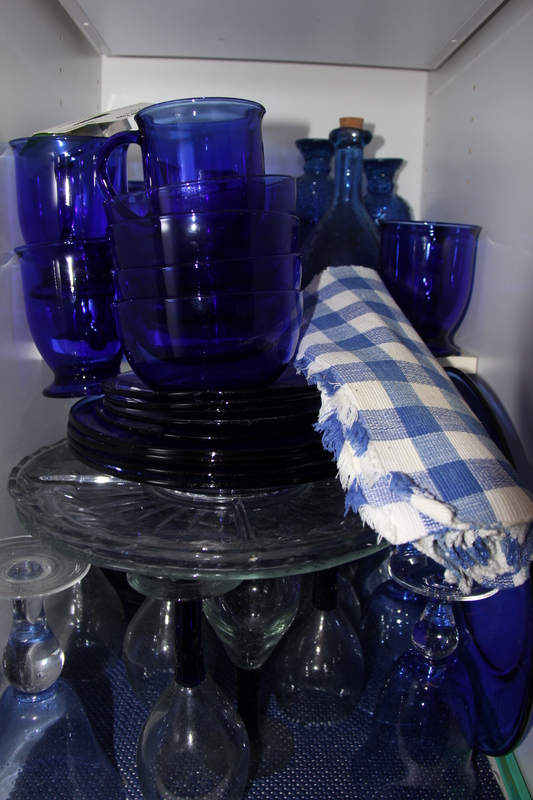 While dishes, in general, please me, cobalt blue ANYTHING makes my heart sing. But I’m not exclusive to blue. There’s the delicately colored bird set with square plates I bought to celebrate Mother’s Day as my mother is as fond of birds as I am of dishes. [Square plates just rock my world.] 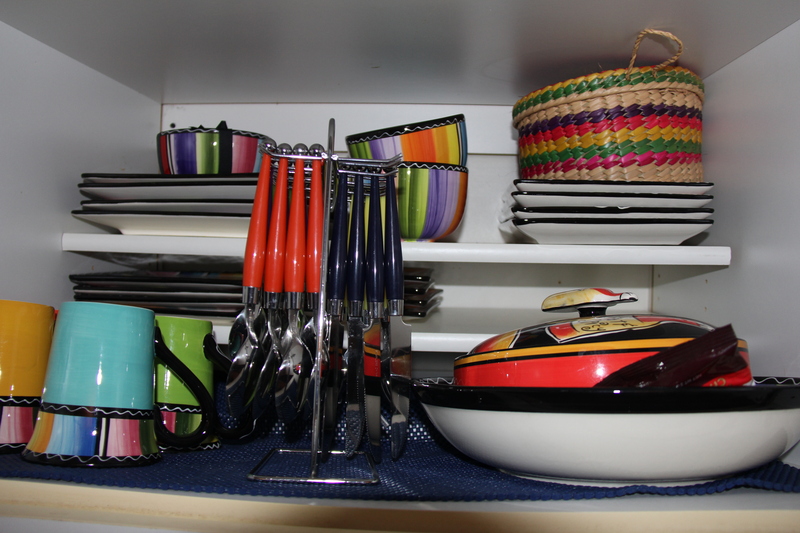 And we can’t forget the brightly colored Mexican style dishes I bought to celebrate HMO’Keefe’s 60th birthday – bright red, orange, yellow and green. With Doug’s death, I inherited some stunning Mexican talavera. Included are two lobster plates that I gave him one year for his birthday. Doug was as fond of talavera and lobster as I am of shoes. Of course, there’s the “good china” and matching stemware that was a gift from my father. I’ve told that story already. I have a 4-piece place setting of some beautiful Lennox Christmas china that I use for Chef Boy ‘R Mine’s private Christmas dinner. For years, I wanted enough Christmas dishes to feed a large horde should one ever show up for the holidays. 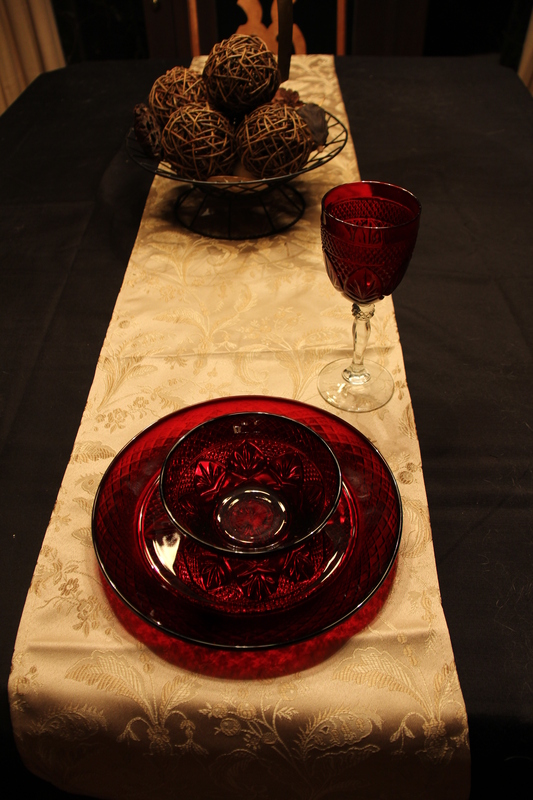 A few years ago, I found some beautiful antique ruby red, cut glass dishes at Target. They were stunning and stunningly affordable. Over three years, I bought 24 plates, 24 bowls and 4 goblets. The goblets always sold out before I could get in to buy them. It’s nagged at me for eons that I can’t provide beverages in matching glasses for the 24-person-horde that has yet to show up. Yesterday, I went on an online shopping binge. In addition to buying more Christmas village pieces (that I certainly don’t need – but what’s need got to do with it), I found 20 goblets from various sellers to complete the Christmas dishes. I am STOKED. I am so excited about it that I’m resolved to invite 24 people over to the house this holiday season! I do love cobalt. Also square plates. Also bright yellow mugs.